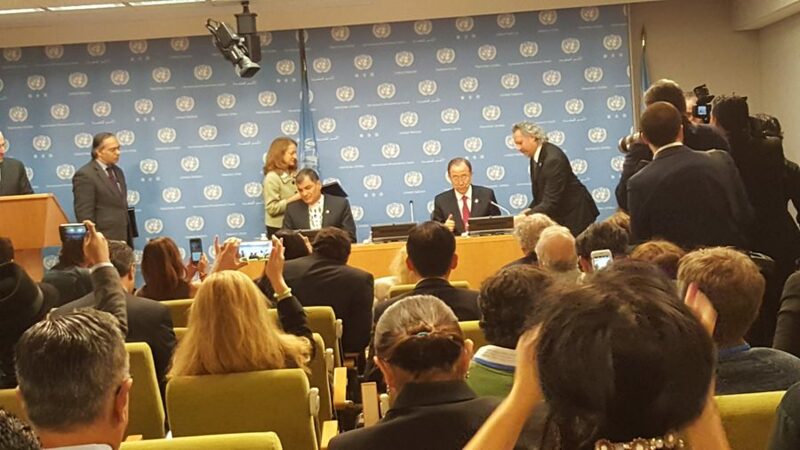 United Nations Secretary-General Ban Ki-moon and Ecuador Constitutional President Rafael Correa signed a joint letter inviting heads of state and government to participate at the Habitat III Conference that will be held in Quito, Ecuador, this October. Both leaders highlighted the significance of the Habitat III process and the historic opportunity it offers to change the way we think about cities and how we build, plan, and manage them in a more equitable, sustainable, and resilient way. After signing the letter of invitation, Secretary-General Ban Ki-moon gave a few remarks, noting that Habitat III is taking place during the critical first year of implementing the 2030 Agenda for Sustainable Development and how important will be for the New Urban Agenda to chart a clear path towards achieving a sustainable world. He also acknowledged the work being done in preparation for the conference, specifically thanking Ms. Maria de los Angeles Duarte, Ecuador’s Minister of Urban Development and Housing, and Dr. Joan Clos, Secretary-General of the Conference, for their leadership in the preparatory process towards Habitat III. The Secretary-General concluded his remarks by expressing confidence in the capacity of Habitat III to deliver the impetus for sustainable development the world needs, and that he looks forward to its success in October. Following the Secretary-General, President Correa also shared insights, underscoring the need to seek new alternatives and new solutions to how we live in cities, and how business-as-usual is not sustainable over the long term and can have serious repercussions on the planet. He drew on the importance of a paradigm shift in order for people of diverse needs and cultures to live harmoniously together in cities, and for that harmony to extend as well between people and environment. Habitat III, formally known as the United Nations Conference on Housing and Sustainable Urban Development, takes place every 20 years. It will be the first time the Habitat Conference is held in the Global South. Latin America and the Caribbean is the most urbanized region in the world with over 80% of its population residing in urban areas. The New Urban Agenda, the resulting document of Habitat III, endeavors to be focused, forward-looking, action-oriented, implementable, and measurable. As October nears, activities and engagement leading to the conference continue with a steadily rising momentum, giving the world much to look forward to with regard to the future of its cities, and how that future will be secured in the next 20 years.